Hey, D'Artagnan! Why don’t you grab your pals Athos, Porthos, and Aramis (aka, your roommates) and try defending yourself alongside them at the upcoming Halloween bash? That’s the life of musketeer! You don’t have to fly all the way to Paris to make your musketeer dreams a reality; after all, you have been taking fencing for years and this toy Musketeer Sword feels natural in your hand as you parade through the costume party. Such an iconic weapon calls for a classy and classic costume, so ensure that you’ve paired it properly with a fabulous hat, at the very least. 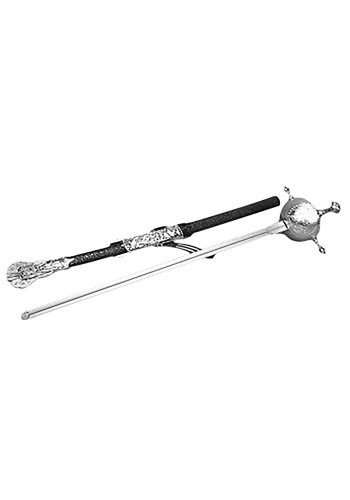 This sword has a shiny gold colored handle and a narrow grey blade. The brown plastic scabbard can be attached to a belt, so you can keep your weapon handy at all times throughout the night, lest anyone arrives to challenge you to a duel! All for fun, and fun for all!